A 6/9 chord is a major chord with a 6 and a 9 added. It is built with a root (1), major third (3), perfect fifth (5), sixth (6) and ninth (9). 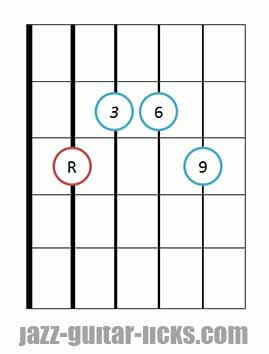 6/9 voicings are very cool because they have a somewhat more interesting, ambiguous and rich sound. They are great for substituting major chords. This type of chord also can embody a fourth-stack. For example, with C6/9, we got C in the bass and three notes stacked in fourth from the third of C (EAD) gives you C6/9. You can see the post about quartal harmony for more information regarding to chords in fourths. Some type of chords can be confusing. Here is a summary chart. 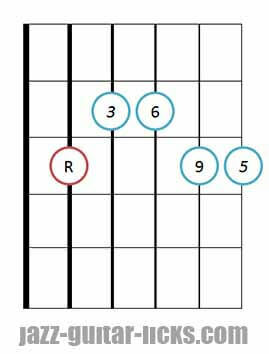 6/9 chords can be written 6-9, 69, 6/9 or 6add9. As you can see, 6/9 chords are built with a root (R) and four notes stacked in fourths (3,6,9 and 5). Starting from the major third of a 6/9 chord, we get a m11 chord. This chart below shows you the relationship between C 6/9 and Em11. 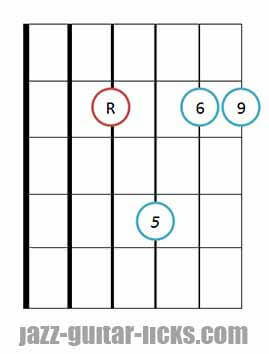 6/9 guitar chord shape - Roots on sixth and first string. 6/9 guitar chord diagram - Root on sixth string. 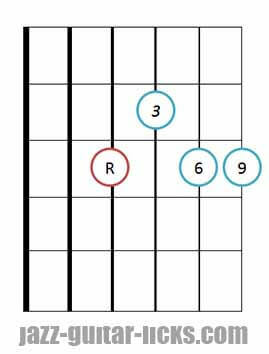 6/9 guitar chord shape - Root on fifth string. 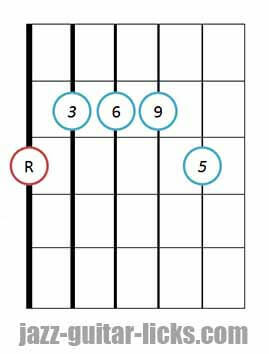 6/9 guitar chord shape - Root on fifth string - No fifth. 6/9 guitar chord shape - Root on fourth string - No third. 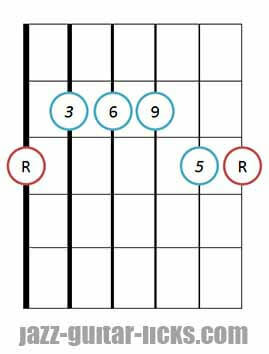 6/9 guitar chord shape - Root on fourth string - No fifth. How to use 6/9 chords? In this first II-V-I in C major, we will use three chords. Dm11 with no root (rootless). C69 with no root. If you have read right the previous explanations, this chord can be considered as Em11. In this example, G7 is replaced by G6. Then two chords, C6/9 and Cmaj6 are played instead of Cmaj7.